Tulips are one of the most recognizable and loved flowers. The identifiable shape and multipurpose meaning make tulips a comfortable choice when growing or sending flowers. Tulips come in many colors, such as yellow, red, pink, orange, purple and white. Some combine more than one color. Each variation possesses a different meaning, but white tulips convey many messages. 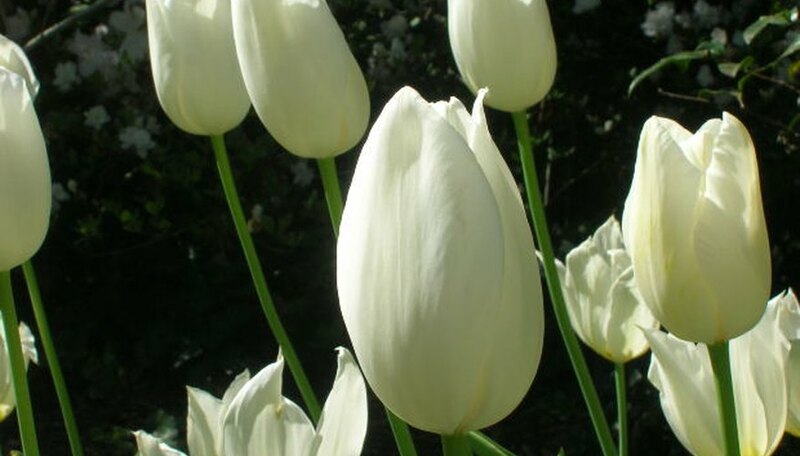 Portray humility, purity and innocence through white flowers, including tulips. Tulips also claim your worthiness, sending the message "Let's take a chance." Send a message of forgiveness with white tulips. If you buy this color tulip, you're asking someone to "please forgive me". Use white tulips at a funeral to show respect and remembrance. Because the understated flowers are not shiny, they work well in funeral floral arrangements. Add white tulips to wedding bouquets and arrangements because the color symbolizes purity. Choose between many variations. Single tulips have six petals. Other options include double flowers, lily-flowering types, ruffly parrot varieties and fringed petals. Tell someone they have beautiful eyes by giving them variegated tulips, which combine color patterns. There are many varieties, including those with white and bright colors, and their meaning is different than pure white tulips.